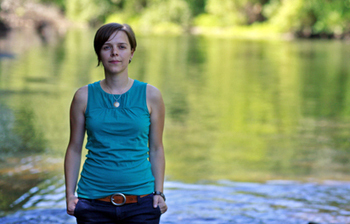 Sociology Ph.d. candidate Abby Brown's research is on water and public sanitation. Abby Brown's research focuses on empowerment and gender equality in water and sanitation in the United States and abroad. She is also an activist for public sanitation facilities, working with a Portland, Ore. volunteer advocacy group known as PHLUSH (Public Hygiene Lets Us Stay Human). The group selected her for a travel grant provided by the World Toilet Organization for the trip to South Africa where she will speak on toilet needs in North America, including public restroom design, emergency sanitation, and ecological sanitation. She is documenting the World Toilet Summit proceedings taking place December 4-6 by live blogging at plush.org and tweeting at @WaterfortheAges. This year is the first that the summit has been held in Africa. In the Monterey Bay Area, Brown is collaborating with an effort by the Service Learning Institute at California State University, Monterey Bay, to provide toilets for the homeless in Salinas. Brown is an environmental studies graduate of Evergreen State College and holds an M.S. in water resources policy and management from Oregon State University. Improved sanitation has been shown to reduce mortality in developing countries, UCSC Sociology Department chair Ben Crow said. "There is also a growing movement in many countries supporting the provision of access to safe sanitation for the more than 2 billion people worldwide who lack it," he said. The World Toilet Organization was founded in 2001 to improve sanitation conditions globally through advocacy, inventive technology, education, and building local marketplace opportunities. Sanitation plays an important role in ending poverty, creating gender equality, and keeping children in school, the organization says.